Although reflecting about past activities in teams is generally considered a very effective strategy for learning and improving team performance, previous research on this topic has often revealed contradictory results. Some studies even reported negative relationships between team reflection and team performance, suggesting that the relationship is more complex than originally expected. Since this represents a very interesting conflict between the theoretical assumptions and the empirical data, we tried to find new explanations for these results. When discussing the possible reasons, we came up with the idea that it may not be enough to ask teams how often or to what extent they reflect, but that previously unobserved factors could also play a role. In fact, in our investigations, we often witnessed teams that reflected only on a superficial level and that even when these teams realized that something was wrong, they seldom used the opportunity for in-depth analysis, further compromising their future performance. Accordingly, we wanted to determine whether both the quantity and quality of a team meeting needed to be considered in order to better understand the relationship between team reflection and team performance. Although we believe that our findings provide important insights for the reflection process itself, we also believe that the general idea of the simultaneous consideration of quality and quantity is also applicable to other team processes. For example, other discussion-based processes, such as team planning, could be subordinate to similar principles. We therefore think that the distinction between quantity and quality can also provide valuable insights in other areas of research. Our perspective on teams is still comparatively simple because we base our conclusions mainly on averages that are believed to represent a team and its actions appropriately. However, we have often seen in our own research that team members can sometimes judge the same object in a fundamentally different way. For example, we observed some very strong team leaders who literally repressed all of the other team members’ reflexive activities and assumed that the feedback we provided was manipulated, rather than admitting that their way of solving the problem was suboptimal. Accordingly, future research should include this plurality within teams more closely in their studies and conclusions in order to get a better and, above all, more complete picture of how team members interact and how these interactions affect the outcomes of a team’s actions. Stay up-to-date with the latest research from Small Group Research and sign up for email alerts today through the homepage! Although our research and the result—a working measure of workplace dignity—merit discussion, Kristen (my coauthor) and I both tell the story of this project by describing how it started: As a graduate student studying employee motivation, I came across and grew fascinated by the concept of workplace dignity, only to find no real scale existed to measure it! On a bit of a whim and a wish, I sent an introductory email to Kristen—she has written pretty extensively on workplace dignity—asking if she would be interested in collaborating on a project to make that scale. After she agreed, we carried out our entire 4-study research project, data collection through manuscript writing and submission, remotely, exchanging insights completely through email and telephone. When we finally met in person at a conference, the paper had already been accepted! Technology played a big part in how we collected our data too. Because we wanted to make a scale applicable to multiple work settings, we looked to Amazon Mechanical Turk, or MTurk, to gather responses for our scale validation. In each study using MTurk, we collected more than 450 responses in a number of hours, and were able to retain about 89% of responses after cleaning the data. Many times, I remarked how different this research process would look to an organizational scientist from a few decades ago. I think this kind of research study—authors with a strong, shared interest who meet and work remotely and use innovative data collection methods—will become more normal in coming years, and I would certainly encourage new scholars and researchers to explore digital connections and tools in their own research, especially if they connect with someone with a shared passion. For us, the passion to advance our understanding of workplace dignity really sustained our research. Dignity is such an essential experience for humans, and work remains a major influence in people’s lives. A lot of previous work has looked at ways dignity can suffer as a result of work, because dignity is often only recognized in its absence, but we also know dignity can be enriched or affirmed by work. In developing a valid way to measure dignity, the good and the bad, we wanted to standardize, inform, and expand the conversations researchers are having on dignity, but also to give specific language to employees and leaders on how work impacts their dignity. The scale offers value to research and applied settings, by offering a standard for workplace dignity and a means of quantifying it, which will not only reveal what experiences harm dignity, but how work fosters and builds dignity for workers. Stay up-to-date with the latest research from Group and Organization Management and sign up for email alerts today through the homepage! Technological and social innovations are increasingly generated through informal, distributed processes of collaboration, rather than in formal, hierarchical organizations. In this article, we present a novel combination of data-driven and model-based approaches to explore the social and psychological mechanisms motivating these modern self-organized collaborations. We focus on the example of open, collaborative software development in online collaborative networks like GitHub (github.com). The synthesized approach is based in affect control theory (ACT), and a recent framing in Artificial Intelligence known as Bayesian affect control theory (BayesACT). The general assumption of ACT is that humans are motivated in their social interactions by affective alignment: They strive for their social experiences to be coherent at a deep, emotional level with their sense of identity and general worldviews as constructed through culturally shared symbols. This alignment is used in BayesACT as a control mechanism to generate artificially intelligent agents that can learn to be functioning members of a social order (see bayesact.ca for further information). We show in this article how such a model solves two basic problems in the social scientific study of groups and teams. First, because empirical research on groups relies on manual coding, it is hard to study groups in large numbers (the scaling problem). Second, conventional statistical methods in behavioral science often fail to capture the nonlinear interaction dynamics occurring in small groups (the dynamics problem). The ACT-based models we present allow for sophisticated machine learning techniques to be combined in a parsimonious way with validated social-psychological models of group behaviour such that both of these problems are solved in a single computational model. 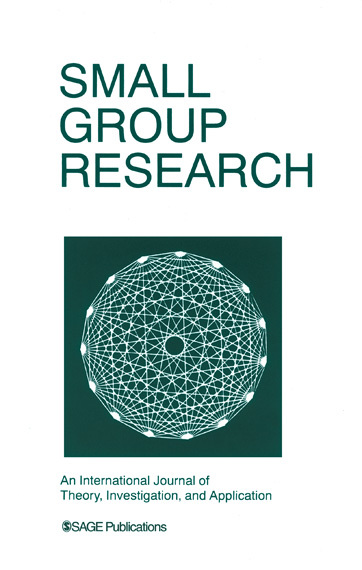 The purpose of the present article is to discuss the promises of this cross-disciplinary, computational approach to the study of small group dynamics. We review computational methods for using large amounts of social media data, and connect these methods to theoretically informed models of human behaviour in groups. To use a metaphor, we are digging into digital group dynamics data with a sophisticated, artificially intelligent shovel, and showing how computational social science can be taken to a new level with this unique and novel combination of data-driven and model-based approaches. The work is an international collaboration called THEMIS.COG (themis-cog.ca) between researchers in Canada (University of Waterloo), the USA (Dartmouth College), and Germany (Potsdam University of Applied Sciences). The academic literature largely paints virtuality in negative overtones, whereas more and more organizations embrace technology-driven work practices, such as virtual work and virtual teaming. This begs the question: If virtuality is so bad, then why do organizations continue to “go virtual”? Our central motivation in pursuing this research was to advance a new theoretical lens through which to view virtuality – that of paradox. Our paradoxical perspective details both the costs and the benefits that virtuality offers organizations; furthermore, it easily lends itself to practical applications, especially applications in the area of virtual team leadership. In our paper, we discuss how virtual leaders can find synergies between the various challenges and opportunities their virtual teams face. Specifically, our perspective suggests that virtual leaders should blend various, and even contradictory, leadership skills and behaviors, to address virtuality’s competing and paradoxical demands. Hence, our paradoxical virtual leadership model emphasizes the ideas of balance and synergy. This stands in contrast to traditional leadership models, such as transformational, relational, inspirational, and others, which advocate for an increased emphasis on such leadership functions in a virtual context. Our article focuses on three main aspects of virtuality— technology dependence, geographic dispersion, and human capital—and identifies seven paradoxical tensions that virtual teams face. For example, one of the tensions that virtual teams experience due to their technology dependence is the touch tension: virtual team members’ interactions are simultaneously impersonal but also less biased. Practically, then, the role of the virtual team leader is to acknowledge and balance the two sides of this tension (and all other tensions their virtual team might face). Our article provides specific suggestions on how to tackle these paradoxical strains. Briefly, virtual leaders must first adopt a both-and mindset which would allow them to perceive virtuality through a paradox lens, and see both its challenges and its opportunities. Next, virtual leaders must devise strategies for simultaneously addressing competing demands. For example, in the case of the touch tension, a leader can encourage more personal and friendly communication, while at the same time implementing strategies to keep interactions professional. Practically, then, our model suggests several applications. First, it suggests that organizations should select individuals for virtual leader assignments who are more likely to develop a synergistic leadership style. Second, organizations should train virtual leaders to reframe their assumptions about virtuality, seeing virtuality as a force to be harnessed, not feared. Finally, organizations should also instill a paradoxical view of virtuality in virtual team members, not just in virtual leaders, either through selection, or through training. In keeping with the core question that provoked this research—If virtuality is so bad, then why do organizations continue to “go virtual”?—our advice to virtuality scholars is to focus their efforts on better aligning our science with the practice of virtual work and virtual teaming. Describing just the challenges or just the opportunities of virtuality only tackles one side of this complex issue. In contrast, understanding the interdependencies between virtuality’s costs and benefits allows scholars to advance and test theories with a stronger grounding in reality, and allows organizations to truly harness the power of paradox. We are pleased to congratulate Dr. Wei Zheng from the University of Wisconsin and Dr. Jun Wei from the University of Science and Technology Beijing, China for winning the Small Group Research 2017-2018 Best Paper Award. The abstract of the article, “Linking Ethnic Composition and Performance: Information Integration Between Majority and Minority Members,” is below and the article will be free to read for a limited time. Often labeled a double-edged sword, diversity can not only trigger social categorization that dampens group cohesion and performance, but it can also increase available information resources and enhance group performance. The ways in which a group integrates information from diverse members play a central role in determining whether and how it can reap benefits from diversity. Guided by research in team diversity and relational demography, we take a diversity-as-disparity approach and focus on the extent of information integration between majority- and minority-status members in a group. Specifically, drawing from social network research, we examine whether majority–minority information brokerage equality mediates the impact of ethnic composition on group performance. Based on data from 540 employees in 34 work groups from a Chinese organization, we find that majority–minority information brokerage equality mediates the impact of ethnic composition on performance but only when group climate is high. We also discuss theoretical and practical implications. Have research on important group and team research literature? Check out the submission guidelines for the 2021 Review Issue! We are fascinated why some leaders succeed and others don’t in getting the most out of their teams. Knowing that team processes determine team effectiveness we wanted to know how leadership makes a difference in teams. Keeping in mind that one of the fundamental team processes is sharing knowledge and discussing what is shared to build advanced or new knowledge that enable developing the necessary solutions as a team. We were intrigued by the question how team leaders can facilitate this process of team learning without over-structuring it and leaving no space for team members to exhibit the necessary behaviors themselves. Many different leadership behaviors can be effective, but team leaders simply cannot display all necessary behaviors by themselves. Moreover, what can you do as a team leader when your team faces a task that is unstructured or for which you also do not have the answers? What is the best advice for these team leaders? In answering this question, we wanted to identify when leadership propels teams in building new or advanced knowledge. In what ways is your research innovative and can it impact the field? After synthesizing the 2000+ scientific hits on the topic, we showed that encouraging, structuring and sharing team leadership behaviors all support team learning. Interestingly, we also found new evidence that the type of team task determines which leadership behaviors can best be displayed to support teams in building new or advanced knowledge. As a consequence, the advice for team leaders is to vary their behavior depending on the team task and to ascertain the specific team situation in their choice. If pioneering ideas and new products of teams are aimed for, team leaders should mainly invest in building trust, creativity and enthusiasm, and not inhibit teams from learning by putting too much emphasis on the task. If advancing existing knowledge and adaptation of the products is enough to reach team success, team leaders who focus on the task, methods and outcomes are beneficial because such behaviors reinforces using known protocols. It would be interesting to dig into the reciprocal effect of the team process and leadership behavior, as well as how leadership behavior may shift in style and source over time. We mainly found cross-sectional studies that covered just one or two types of team leadership behavior and examines its influence on team learning behavior. Experimental and longitudinal studies on this topic may bring new perspectives on how team leaders can vary their behavior, what kind of effect that has on team learning, and what team leaders can do to use that information in future team interactions, subsequently. We were interested in understanding general principles of coordination in healthcare teams across different healthcare settings. All of the authors have conducted research in this area for quite some time but usually one study only allows us to study teams in a specific clinical setting. We were interested in seeing if there were any general principles that applied across clinical settings. If so, these could have a much larger impact on the training of healthcare professionals. As this was a secondary analysis of existing data, we each had our own challenges with the initial data collection. It is always fun, exciting and challenging to work with healthcare providers in both real and simulated settings. One exciting finding of the current study is the overlap in coordination requirements across clinical settings and tasks. Triggers for re-coordination, anchoring points for coordination, and a deliberate transition from implicit to explicit coordination during unexpected clinical situations were all consistently noted as exemplars of excellent team coordination. It is important to immerse yourself in the work context you are studying and to continue to build relationships with those that are doing the work. We believe that the interactions with healthcare providers allow us, as psychologists, to make sure our work is interpreted correctly from a scientific point of view but also relevant and used as intended from an applied point of view. Our experience this requires researchers to be able to speak the language of both clinical care and work psychology.